The idea seemed ridiculous to a musician navigating the white water of the jazz, african, and improv music scenes in New York, given the resources needed and the social instability he saw. But the thought stayed in Sylvain’s mind. 18 years later his far flung musical experiences coalesced giving him a unique place in the musical world . Years later he went back to guinea and through his friend and bandmate Keba Sissoko, met Kouyate family of traditional musicians, M'Bady Kouyate and his sons Sekou Kouyate and Ba Sissoko. M’bady years earier came to the US with ballet africaine. He returned in 2003 for a wedding after became friends with his cousin Kourou kouyate it was just after recording his album Fula Flute, ended up doing interviews and the album was a big hit there. At the time, West African music was gaining a foothold in New York, and he was very active on the City’s African music scene, being at the right place at the right time to welcome the wonderful musicians from French-speaking West Africa who were arriving on the scene. Conversely, through his friend and collaborator Keba Sissoko, Sylvain became close with the Kouyate family of traditional musicians and in 2003 went to visit djeli M'Bady Kouyate and his sons Kourou, Sekou and Ba Sissoko. Many years earlier in the late 50s, M’bady, one of the greatest kora players of his generation, had toured the US with the Ballets Africains and participated in a celebrated residency at the Apollo theater. By then Sylvain had recently released the album “Fula Flute” and it was a sensation in Guinea, he met journalists, did interviews and the album was a hit. He grew close to the Kouyate family and went back many times to visit and he started thinking about the school idea again, although it still seemed very impractical. It was during a later visit, he started thinking abut the school again talking with Koulu who became excited about the idea, although it still seemed impractical. With the international success of Fula Flute, Sylvain had begun making 3 holed traditional flutes on request from other musicians. One day he was experimenting and discovered that if he added three more holes to the traditional flute he had a fully chromatic tambin flute, which, to his surprise, he managed to patent. With that discovery, he realized he could use this new instrument to teach children to read and write music. Suddenly, the idea of the school was possible, he could go to a plumbing store, buy some plastic tubing and knock out a bunch of flutes for the kids. Back in New York, he did a Kickstarter campaign that raised $25,000, so in February 2014, he returned to spend 4 months teaching the Tyabala children and they responded wonderfully. During that time, they recorded a CD (Les Enfant de Tyabala) and a film was made to fulfill the Kickstarter obligations. An event was held to present the results and afterwards, an attendee approached and offered to finance a teacher to keep the flute playing going in Sylvain absence. 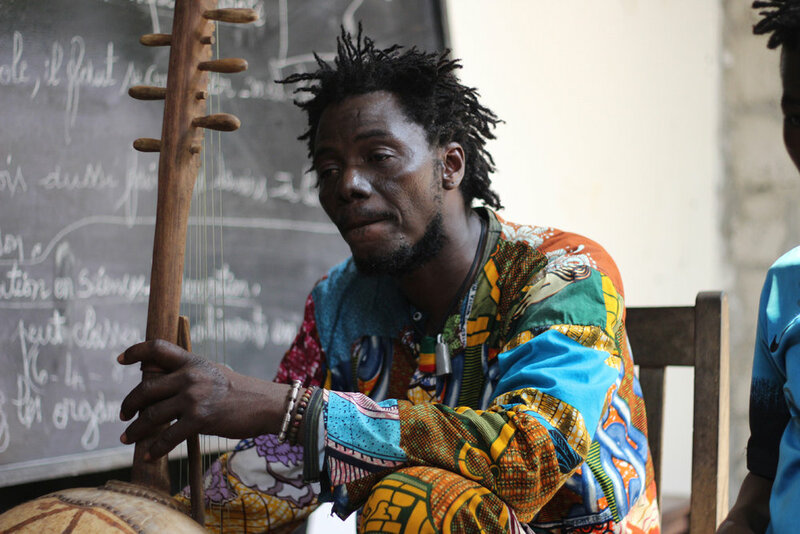 This is howMamady Mansare, a legend of the malinke flute, who recorded and toured with many artists accepted and began the challenge of teaching. He was instantly amazed by the children’s enthusiasm for the flute. and you are the water!!! The school has steadily increased its presence in Conakry, it has grown to provide a beacon for the revival of traditional arts. All teachers and staff members are locally based, except Sylvain. Fula Flute home page/link to donate. Your tax-deductible contribution (U.S. only) will help provide teachers, instruments, school supplies, clothes, medicine, food, etc. Sylvain wrote this note after his latest visit: “Back from my visit to Guinea, I am happy to report that, thanks to your help and the hard work of our teachers, students, administrators and support personnel, l’école fula flute is doing well. The children found themselves out on the street in the rain, desks, theater equipment, instruments, but they continued to study. Since then the school has been on an upward path, Sylvain visited in early 2017 and found the place clean, painted, and a stage built in the courtyard. Because they had been working outside, some of their more formal studies had fallen by the wayside, now they were back in class every morning, and in the afternoon, the arts: Malinke flute, theater, dance, percussion, singing. Tanly, a piano player, is now teaching music theory, they have a boxing teacher, Veronique is teaching storytelling. Djamady Kouyate, a son of the MBady family is teaching kora. 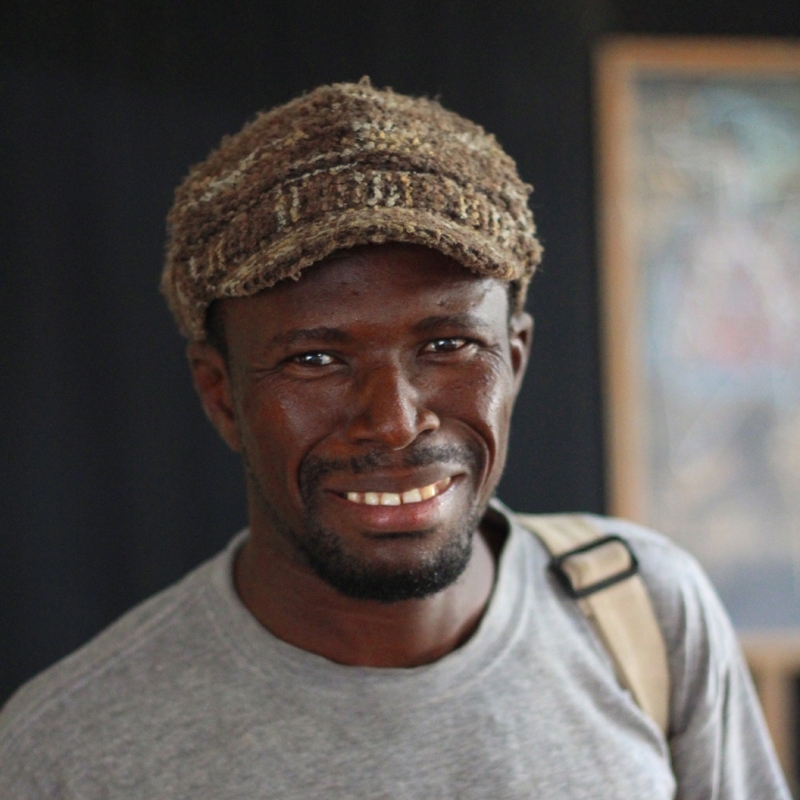 They have been playing shows and recently Babagale Barry began to teach Fulani style flute. Fula Flute home page/link to donate. Funds go towards teachers salaries, rent, maintenance, supplies, director, asst director, monitor, cooks, custumes, instruments. Centre Tybala, acting school began in 2009, Ecole Fula Flute, today some of older kids have gone on to form a theater company, now help teach the newer kids. As a result of the work there is a new generation of traditional flute, kora, ngoni, djembe, players. The school has created a model that is being considered as a template for education elsewhere in Guinea. 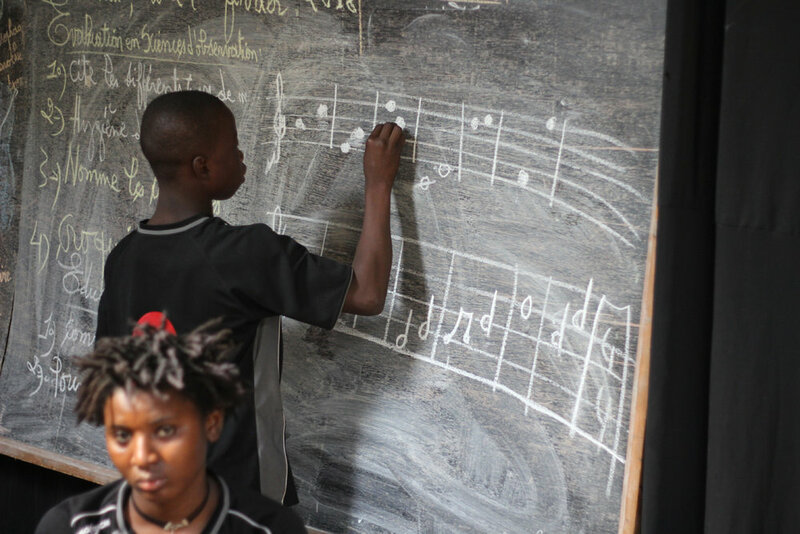 Sylvain: “I’d like to bring in people from here or Europe to teach for a few months, bring in more students.” The ultimate vision for l’école fula flute is to develop a music literacy method based on the chromatic tambin that could be applied generally to elementary schools. In the meantime, the initiative is contributing to invigorate traditional music in general and flute playing in particular. Sylvain Leroux can be heard in the New York area with Adam Rudolph’s Go Organic Orchestra, Karl Berger’s Improvisers’ Orchestra, his own groups “Source,” “Fula Flute” and other projects. Sylvail Leroux at a historic gatering of West African Griots, presented by LiveSounds at Elebash Hall, November 27th, 2012.